Precision molded Ultra-Sphere connectors will perform double duty as a vibration elimination pump connector, or as an expansion joint, absorbing pipe movements. Ultra-Sphere connectors are perfect for HVAC or industrial applications where a flexible connector is needed to absorb axial, transverse, or angular pipe movements. Ultra-Sphere rubber connectors are also superior to braided metal connectors for absorbing vibration and noise generated by mechanical equipment. Ultra-Sphere connectors are precision molded in hydraulic presses. The spherical design ensures that internal pressures are exerted in all directions, distributing the forces evenly over a large area. The spherical design acts as a free-flowing arch, reducing turbulence and growth due to pressure thrust forces. 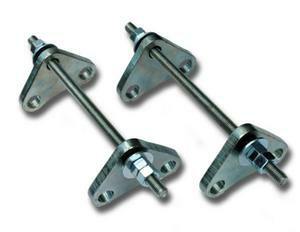 These connectors are manufactured with a high-quality EPDM rubber tube and cover, and nylon tire cord reinforcing. Special elastomers such as Neoprene, Nitrile, Hypalon, and Butyl are also available. The standard EPDM material is superior to competitive connectors made of Neoprene due to their higher temperature resistance and physical properties. Galvanized steel floating flanges are recessed to engage the rubber beaded end of the expansion joint and rotate easily for speed of installation. Style U301 single sphere connectors are ideal for absorbing small stress motions and absorbing the noise and vibration emitted by mechanical equipment. 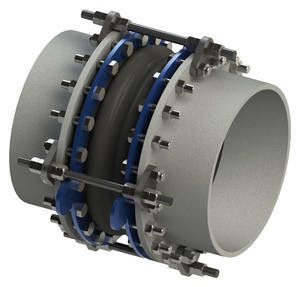 The face-to-face dimensions of these single sphere connectors match the corresponding dimensions of spool type expansion joints, facilitating direct replacements. This short face-to-face dimension translates to economy of space in the piping system and ease of handling and installation. Ultra-Sphere Series 301 & 302 connectors are manufactured to meet or exceed the pressure, movement, and dimensional ratings of the Rubber Expansion Joint Division, Fluid Sealing Association. Sealing Information: When installing rubber expansion joints, it is the responsibility of the installer to ensure bolting forces are evenly distributed to provide optimum clamping force to prevent the connection from leaking. When the expansion joint is being installed in non-ferrous piping systems, such as PVC, reinforcement of the mating flanges may be required to increase the mating flange rigidity. Unisource recommends the use of ring gaskets or full face gaskets when a rubber expansion joint is being installed against a raised face flange. The use of ring gaskets or full face gaskets may be required when installing PTFE lined expansion joints. If you should have any questions pertaining to the installation, please call Unisource or refer to the Fluid Sealing Association Technical Handbook for Non-Metallic Expansion Joints. Series 302 double sphere connectors are similar in construction to the single sphere style, but with a second sphere to provide even more pipe movement absorbing capability and even greater efficiency for noise and vibration control. In fact, Series 302 connectors offer the industry’s best option for vibration reduction—up to 98%, depending on pressure and frequency. A plated steel external root ring surrounds the connector between the spheres, preventing ballooning or swelling under pressure. Unisource Series 303 female union connectors are ideal for isolating small diameter piping from vibrating mechanical equipment. In smaller size applications where threaded connectors are normally used, Series 303 double sphere union connectors will accommodate both pipe motions and vibration. Series 303 connectors will provide over 1” of axial compensation, as well as impressive ratings for lateral and angular deflection. The Neoprene or EPDM rubber body construction is also far superior to metallic connectors for eliminating noise and vibration generated by equipment such as pumps, chillers, and air handlers. These connectors are extremely versatile and can be used in a variety of services, and are available in designs to handle up to 150 PSIG and temperatures up to 200 degrees F.
Ultra-Sphere expansion joints are precision molded in hydraulic presses. The spherical design ensures that internal pressures are exerted in all directions, distributing the forces evenly over a large area. The spherical design acts as a free-flowing arch, reducing turbulence and growth due to pressure thrust forces. Series 303 Ultra-Sphere connectors are constructed with a high-quality EPDM tube and cover and nylon tire cord reinforcing. Neoprene construction without cables is also available. Series 303 EPDM connectors offer high-temperature EPDM rubber for tube and cover construction. Galvanized ductile iron threaded female union ends are standard. Special cable restraint attachments surround each end to prevent the connector from over-extending due to pressure thrust. A steel body ring encircles the rubber between the spheres to provide stability under pressure. Series 309 “Power-Flex” double-sphere connectors are the industry’s safest and best-performing answer for heating and cooling system piping connections. This series is the best combination yet for high-pressure, high-temperature durability and vibration and noise reduction performance. In fact, Series 309 “Power-Flex” connectors offer outstanding vibration reduction—up to 98%, depending on pressure and frequency. This is the safest and most reliable rubber connector yet developed for handling hydronic fluids with high-pressure and high-temperature combinations. “Power-Flex” connectors are precision built in America and meet “Buy America” provisions. The spherical design ensures that internal pressures are exerted in all directions, distributing the forces evenly over a large area. The spherical design acts as a free-flowing arch, reducing turbulence and growth due to pressure thrust forces. Other manufacturers balloon-form their sphere prior to curing, possibly spreading the Kevlar® reinforcing and degrading the pressure rating. “Power-Flex” reinforcement is not spread during curing, providing a product with extremely high burst pressures (minimum 4:1 safety factor vs. 3:1 for our competitors). These connectors are standard with a peroxide cured EPDM rubber tube and cover, and DuPont Kevlar® (aramid fiber) reinforcing. With this construction and unlike molded expansion joints with balloon pressure curing, “Power-Flex” does not experience reinforcement spread during manufacturing and has little pressure rating degradation below approximately 400 Deg.F. “Power-Flex” is rated for a full 250 PSIG working pressure, even at 250 Deg.F operating conditions. Special elastomers such as PTFE/TFE/FEP, Viton, or Chlorobutyl are also available. Kevlar® wrapped around a solid steel ring in the base of the rubber flange portion eliminates the reinforcing from pulling out of the flange and provides a superior sealing force when compressed against the mating flange during installation. The standard floating flanges are 150# drilled epoxy-coated carbon steel. Galvanized, stainless steel and other alloy type materials are also available. A plated steel root ring in embedded in the joint between the spheres, preventing ballooning or swelling under pressure and adding hoop strength. Series 309 “Power-Flex” expansion joints are ideal for many demanding industrial applications such as HVAC systems, water & waste treatment, power generation, pulp & paper, chemical handling, mine processing, and marine. 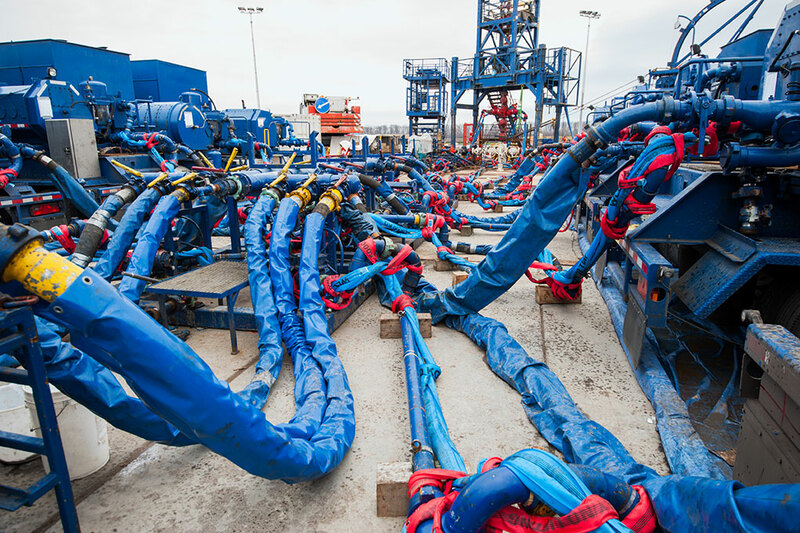 Control units are always required in unanchored piping systems and are recommended in all other pressure applications as a backup safety device in the event of anchor failure, as recommended by the Fluid Sealing Association. 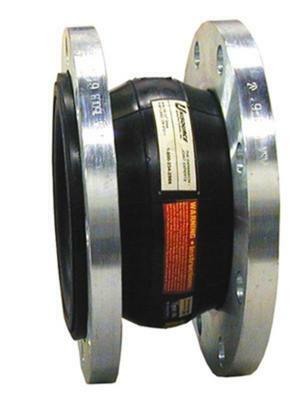 Style 1200 “Flexi-Spool” rubber expansion joints are designed to handle a multitude of industrial applications. “Flexi-Spool” expansion joints are a spool-type, hand-wrapped expansion joint with several construction features that provide advantages over standard expansion joints. The wide-arch style of “Flexi-Spool” provides several times the movement capability of standard narrow arch style joints. A high-pressure reinforcing combines both polyester fabric plies with steel wire for impressive working pressure and vacuum ratings, even at extended temperatures. 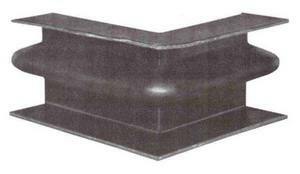 A thick, wrapped-on rubber cover protects the reinforcing from damage and the environment. Full-face duck and rubber flanges provide an optimum sealing surface. A built-on flange O-ring allows the flange to seal faster, and with less torque required. Both tube and cover can be provided in a variety of materials in order to handle conditions involving chemicals, moderate temperature extremes, abrasion, or other conditions. Materials include Neoprene, Chlorobutyl, natural rubber, Nitrile, Hypalon, and are also available with white PTFE liners. Series 1500 Ultra-Spool expansion joints are a domestic, hand-built product for the most demanding of applications. A precision built product designed to provide exacting specifications for tube and cover requirements, pressure ratings, markings, and special options. The wide arch will provide much greater movement capabilities than standard narrow arch designs. The tube can be constructed using a variety of elastomer products including EPDM, Chlorobutyl, Neoprene, Nitrile, Hypalon, Viton. When needed, a white PTFE liner can be added. Rubber tube thicknesses are approximately 1/4” thick for greater wear life. Reinforcing of multiple plies of polyester provide 225 PSIG working pressure in sizes up to 14” diameter. Thick steel body rings add hoop strength and assure high vacuum rating, even at extended temperatures. Each expansion joint has a permanently embossed brand on the cover with information including individual serial number for identification. Unisource metallic retaining rings are designed for use on all elastomeric expansion joints with duck and rubber flanges. Metallic retaining rings must be used when connecting the rubber flanges of expansion joints to the mating piping system flanges. Retaining rings consist of split circular sections of 3/8” thick carbon steel or stainless steel, drilled to match the expansion joint flanges. Edges are chamfered. Retaining rings are zinc plated or galvanized. Sizes range from 1/2” to 144”. Constructed to meet FSA Rubber Expansion Joint Division standards. Control units are recommended for use on Ultra-Sphere connectors when it is not possible to install solid anchors in the piping system. Although it is theoretically possible to pre-elongate spherical connectors to avoid the effects of extension due to pressure thrust forces, Unisource does not recommend this practice in lieu of anchors and control units due to the unpredictability of subsequent pressure spikes and system pressure tests. To isolate vibration that could travel across solid control rods, Unisource utilizes minimum 1/4” thick reinforced grommets on each end of our control unit rods. UNISOURCE SERIES ED. Style U expansion joints are elastomeric in both body and flange and are available in Neoprene, Hypalon, EPDM, Butyl, or fluoroelastomer Viton. Thinner in overall gauge than pressure piping expansion joints to protect thin wall duct systems. 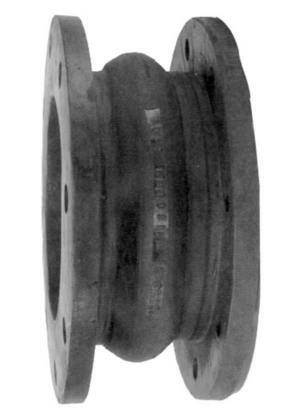 Standard circular expansion joints have integral duck and rubber flanges, drilled to order. 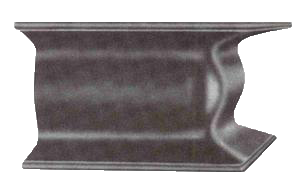 Rectangular style also incorporates rubber flanges, utilizing square corners and special drilling. “Continuous corners” eliminate splices through the body of the expansion joint near the corners. The inherent flexibility of rubber provides long service life even in applications of high vibration or flutter. 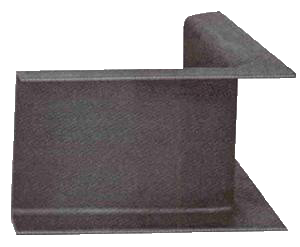 Style “U”, a U-joint without arch, designed for normal ducting movements. Series ED expansion joints require metallic backing rings or bars. Typical retaining bars are made of 3/8” x 2” A-36 chamfered or round ed edge bar stock. UNISOURCE SERIES ED. Style A expansion joints are elastomeric in both body and flange and are available in Neoprene, Hypalon, EPDM, Butyl, or fluoroelastomer Viton. Thinner in overall gauge than pressure piping expansion joints to protect thin wall duct systems. 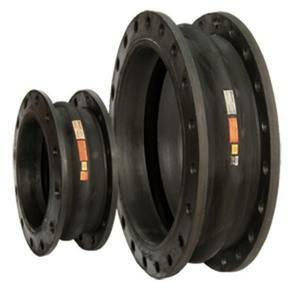 Standard circular expansion joints have integral duck and rubber flanges, drilled to order. Rectangular style also incorporates rubber flanges, utilizing square corners and special drilling. “Continuous corners” eliminate splices through the body of the expansion joint near the corners. The inherent flexibility of rubber provides long service life even in applications of high vibration or flutter. Style “A”, a rounded arch type joint, is designed for increased axial movement capabilities without pre-extension or compression. Series ED expansion joints require metallic backing rings or bars. Typical retaining bars are made of 3/8” x 2” A-36 chamfered or round ed edge bar stock.